I am weak...soooo weak! I think we all have guilty pleasures and can admit to buying things from time to time that we absolutely don't need. I mean who hasn't walked into Target on a mission to buy shower curtains and ended up leaving with an outfit, shoes and accessories to match? Just me? I don't believe you! Sadly, for me it's not just Target. I feel like I do this with every store, I have such an impulse to buy things no matter where I go. This past weekend I visited my local beauty supply store supposedly on a mission for a friend, but of course as usual the cosmetics section was calling me! 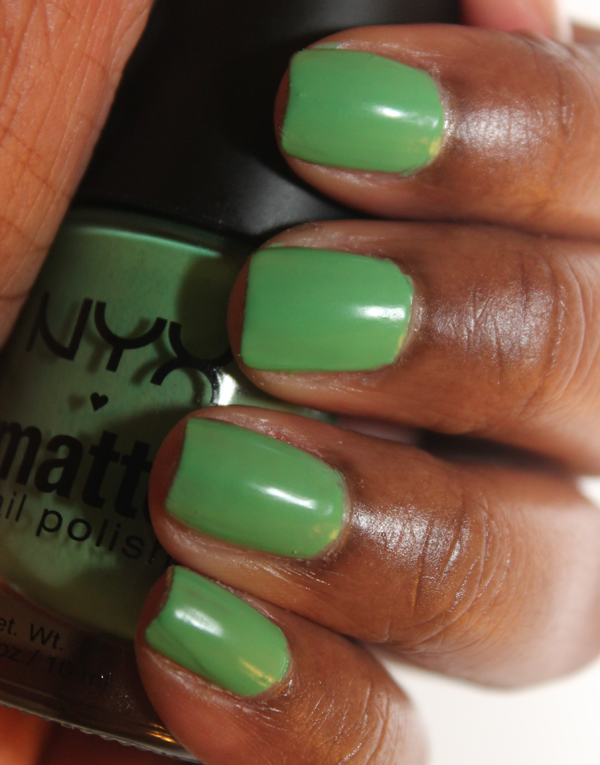 My BSS has a pretty nice size selection of NYX products and I've been meaning to try out their matte nail polish for longest. And at just $1.99 there was no need for convincing. 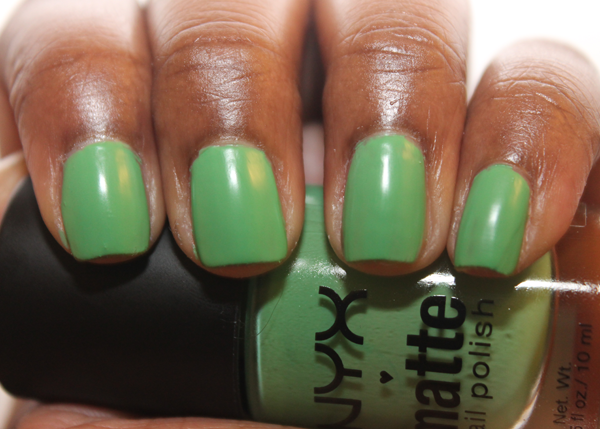 I'm still kinda on the fence about mattes so I decided to just go with 1 polish to get a feel of it. 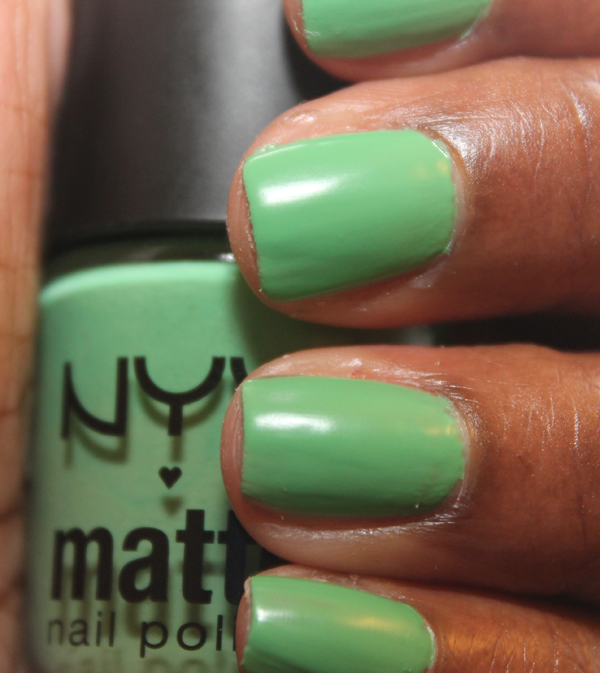 I chose "Mint MNP04" which is a soft matte mint green. Check out my swatches and thoughts below. Glow: For starters NYX formula is always consistent and this was no different. It's easy to apply and I was able to get it completely opaque after just 2 coats. Also, I love that despite it being matte it still produces a nice little shine. The wear is also pretty good, I went about 3-4 days before noticing any chips or peeling. Glare: None! 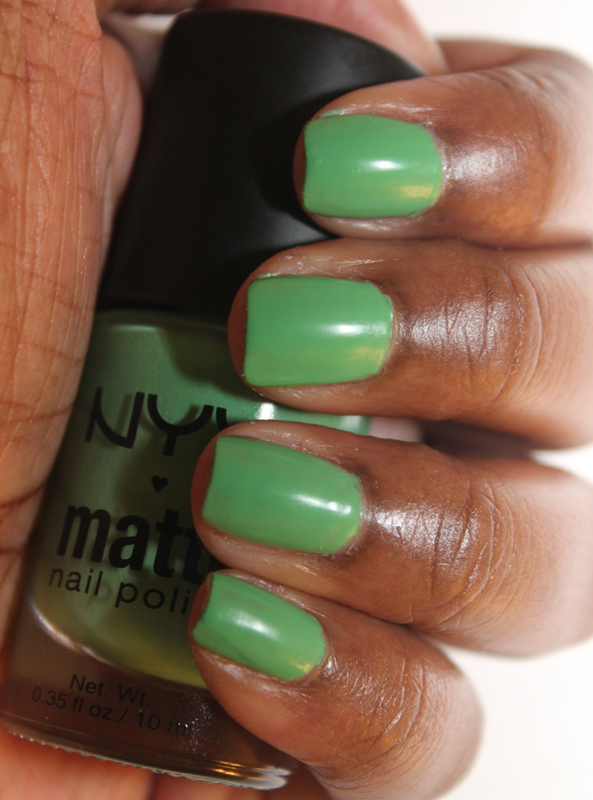 For a matte, this polish was a bit glossier than I expected but I like it. It takes a bit longer to cure and dry completely than the regular glossy polish so just be sure to take that into consideration if you're in a rush. Would I Recommend It? I would! I'v'e seen the prices of these polishes vary by location and $1.99 has been the cheapest. NYX's regular polish retails for $4 on their website so I'm not sure why the prices fluctuate so much in stores but either way it's a great buy! Where To Buy: I've seen these polishes pretty much everywhere, beauty supply stores, Walgreens, etc. You can find locations that cary the brand near you from their website. To purchase or to learn more please visit nyxcosmetics.com. That color looks great on you! I know what you mean about going into Target, or any store. I always walk out with stuff I didn't intend to buy. Lately I can't go anywhere without buying some nail polish.